Join Green Caffeen and become part of the solution. GREEN CAFFEEN 2.0 IS HERE! What this means for you: You will no longer be charged a monthly subscription fee. The Scheme is now FREE* to use forever! You will only pay a fee if you fail to return & scan your reusable cup to a participating café within 30 days. Thanks for being a Green Caffeen Hero & Helping Save the Planet .. 1 Cup at a Time! 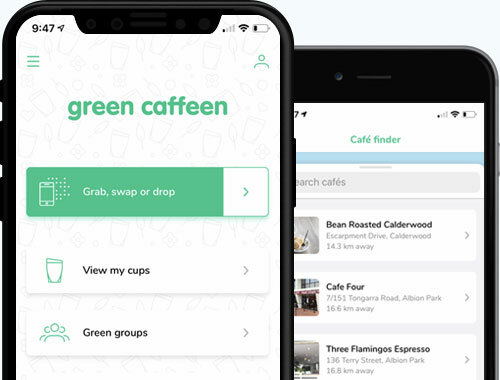 Download the Green Caffeen app to get started! Disposable cups are hurting our environment. Our eco-friendly cup solution gives you unlimited access to re-usable green cups for your coffee, tea, or other hot drinks. 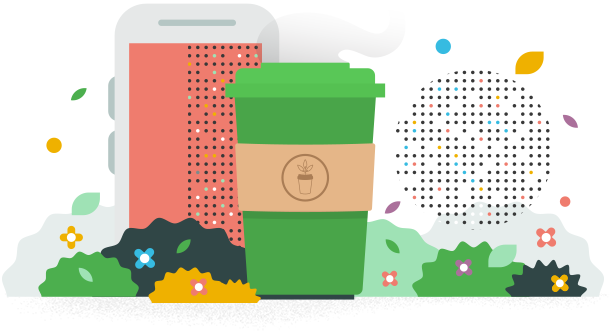 Simply signup and purchase your drink at a participating cafe, consume your drink, then return the used cup when you’re finished. You can return your used cup to the same cafe or any other participating cafe. Then grab a fresh cup the next time you order. All for the cost of just 1 coffee a month.